We received a question about the Big and Little Dippers. The answer is that, if you are seeing only one dipper, it is probably the Big Dipper in the constellation Ursa Major. This constellation, also called the Greater Bear, contains the Big Dipper asterism that is familiar to so many stargazers because it really does look like a dipper. This is a great time of year to begin looking for the Big Dipper in the evening. Here it is, on today’s chart, shown ascending in the northeast in the evening at this time of year. 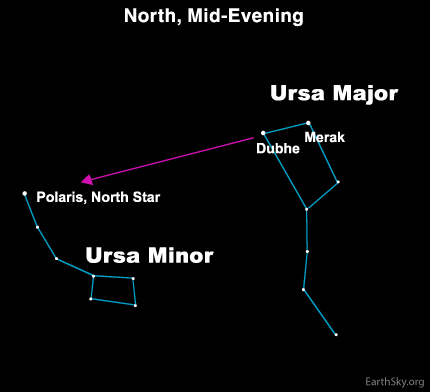 Ursa Minor, the Lesser Bear, which contains the Little Dipper asterism, is much harder to see. Its stars are fainter, and the dipper shape is not so obvious. However, the Little Dipper is easy to spot, once you realize that the North Star is the last star in its handle.